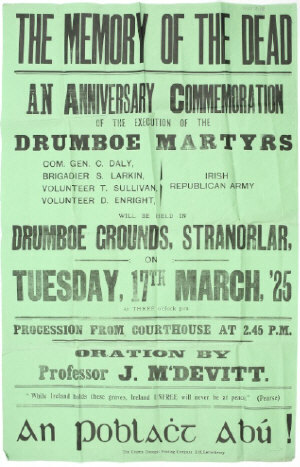 A flyer for a memorial rally for the ‘Drumboe Martyrs’ in 1925. Encapsulating the tragedies of the Civil War, not only were there personal ties between their leader, Charlie Daly, and his Free State opponent, Joe Sweeney, but the former may have previously saved the latter’s life. To add further poignancy, it is quite likely the men were executed in reprisal for a shooting that was not part of the civil war at all. I should, at the very outset, clarify that the Tom Glennon referred to in this article, as a Free State officer, was my grandfather. While it is natural and understandable that some readers may fear that this will lead to family bias on my part, I hope the article will prove any such concerns to have been unnecessary. None of those executed at Drumboe were from Donegal. They had come there to fight the Northern government. The Provisional Government swapped British-supplied rifles with anti-Treaty units in Munster, the southern weapons then being smuggled into the north for use by local units of the IRA in staging an uprising in May. For their part, the Republican Army Executive in the Four Courts agreed to send men from anti-Treaty units of the IRA in Cork and Kerry up to Donegal, under the leadership of Cork man Seán Lehane, in order to launch attacks across the border. By early July, Free State Chief of Staff Eoin O’Duffy estimated that 700 Munster Republicans were in Donegal 1; in addition, several hundred anti-Treaty members of Daly’s old division had fled west from Tyrone and Derry to avoid internment. Co-ordination of Republican resistance was weakened by the fact that at the outset of the fighting, Lehane was in Dublin, taking part in unity negotiations following a split in Republican ranks at an Army Convention on 18th June; he did not return to Donegal until mid-July, having had to walk all the way from Sligo. In his absence, Daly withdrew much of the remaining Republican force to Glenveagh Castle in west Donegal, where he established a new headquarters. One IRA man wanted to ‘plug’ Free State officers Sweeney and Glennon when they arrived for negotiations. It was Charlie Daly who stopped him. There were immediate attempts to negotiate an end to the fighting. 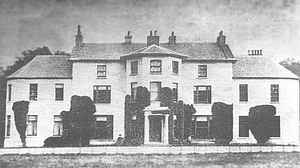 On the morning of 5th July, Sweeney and Glennon travelled under a promise of safe passage to meet Daly and some of his senior officers at Churchill, near his headquarters. Sweeney hoped to agree a basis on which the southern Republicans would leave Donegal; in the event, neither side was prepared to accept the conditions proposed by the other and the negotiations proved fruitless. However, it was the immediate aftermath of the meeting which was to prove poignant several months later. “As Sweeney, Daly, Glennon, Cotter and I dallied at the door, Jim Lane… slouched in and beckoned me over. I went. ‘Jordan and some of the northern fellows outside are threatening to ambush Sweeney and plug him on the way back,’ Lane whispered to me. I was startled. Knowing Jordan’s reputation for recklessness and bloodthirsty callousness, I would not put such a thing beyond him. We had given Sweeney a pledge of safe conduct and he had trusted in our word of honour … Approaching the group at the door, I called Charlie aside and asked the others to hold us excused for a few moments. Unaware that Daly had just prevented their deaths, Sweeney and Glennon left to return to their headquarters at Drumboe Castle. The Free State offensive resumed the following day and they captured more Republican bases at Skeog and Inch Island in mid-July. By then, the Republican force at Glenveagh had been whittled down to eighty and Lehane decided to take his remaining men on the run. As the Republican column separated into ever-smaller groups to avoid detection and capture, the next three months saw a protracted game of cat-and-mouse with pursuing Free State forces. 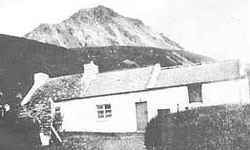 The cottage where Daly and his men were captured. Two other Republicans were arrested in another house nearby. Although the required documents were initially prepared at the end of November, the court martial did not finally convene until 18th January 1923, some two and a half months after the men’s arrest. The prosecutor was a Mr. Cunningham and the court was made up of Deputy Divisional Commandant Joe Seán McLoughlin and State Solicitor William McMenamin. The third member of the court was Tom Glennon: he was now going to hear the case against the man who – probably unknown to him – had saved his life after the abortive peace meeting in Churchill the previous July. The eight republicans were found guilty of bearing arms, ‘without the proper authority’ but heard nothing of their sentence for over three months. The only likely outcome was that all eight would be found guilty which, given the charges, the evidence and the provisions of the Public Safety Act passed the previous October, meant possible death by firing squad. Daly might have sought a lighter sentence by appealing to his past friendship with Sweeney (they had been in university together) or by pointing to his saving of Sweeney’s and Glennon’s lives at Churchill and subsequently going out of his way to get medical aid for two Free State soldiers wounded in an action at Drumkeen in mid-July. But he did not. These actions would suggest that Daly’s nature as an officer was too honourable to even contemplate such a course. Although they had been found guilty of possession of weapons and ammunition, the “Drumboe Martyrs” were shot in reprisal for the killing of a Free State officer. It is thus very possible that the denials of responsibility by both Sweeney and the O’Donnell brothers were well-founded and that the dead officer was actually killed by friends of the arrested drunks who were neither Republicans nor Free State soldiers. 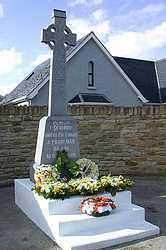 The modern memorial to those executed at Drumboe in 1923. It seems likely that the attack on Creeslough barracks which led to the death of Captain Cannon was – without being properly investigated – simply presumed to have been carried out by the most obvious suspects. As a result of this mistaken attribution, the men subsequently known as the “Drumboe Martyrs” were then executed in reprisal for a killing which had not even been committed by Republicans. Report on 1st Northern Division, 3rd July 1922, Mulcahy papers, UCD Archives, P7/B/106. Historian Robert Lynch estimates that the Munster Republicans in Donegal numbered “at most one hundred” (Donegal and the Joint-IRA Northern Offensive, May-November 1922, Irish Historical Studies, Volume XXXV, No. 138, November 2006) but in view of the number of prisoners subsequently captured by Free State troops, this estimate seems too low. Written by: Publisher on 14 March, 2012. Last revised by: John_Dorney31 December, 2012. 49 Responses to "Today in Irish History, The execution of the “Drumboe Martyrs”, 14 March 1923"
Very powerful article. God have mercy on all of them, whatever uniform they wore. If anything, I think your personal interest would have added to the passion in your research ;) A great story, thanks for writing it. Brilliant article. Hope to see more from this writer soon. Excellent article, meticulous research presented in a very balanced way. really interesting story- thanks be to God we dont live in those times and have to experience what our grandparents and great grand parents had to go through and the choices they had to make and the sides they had to take. Makes the recession a piece of cake. Hey bro – nice to see some of the story finally emerging – I look forward to the book. Hi Kieran, very interesting article in particular for me as my uncle featured. I would like to get further information on my uncle and you may be able to help me. I would appreciate if you could contact me via the following email address; leitirpo@gmail.com. Many thanks, Brian. I was recently told a story by my father concerning my grandfather. He had never before spoke of it but did eventually tell me of my own grandfather’s involvement in the events you desrcibed. As my fathers story goes, my grandfather was under arrest the night before the exicutions along with a number of free state soliders who refused to take part in the exicutions. Any relevant information or directions as to where one could find it would be very much appreciated. I think My own father would like to know before time prevents it. a powerful and moving article. I haven’t come across that story in any of the material I’ve seen during my research, it’s definitely not mentioned in any of the books or articles I read. It may have been mentioned in a military report but all the Operations Reports from Donegal Command for the period January – March 1923 are missing from Military Archives. I’m nearly sure I read somewhere that when they were preparing to hand over power to the first Fianna Fail government in 1932, the outgoing Cumann na nGaedheal government gave orders that all papers relating to Civil War executions should be destroyed. I’m not sure whether this is true. Any of the papers relating to the court-martial of the “Drumboe Martyrs” are in the Ernie O’Malley Papers in UCD Archive – I’ve no idea whether he was given them by a sympathetic Free State soldier or whether he nicked them himself. It all just adds to the overall mystery around this episode. I have no great feeling in regards to Joe Sweeney’s remorse as ‘he’ signed the death warrant on these men and persecuted other republicans throughout the Rosses. Republican families suffered at his hands and he came close to being shot by one of these men who now rests in the same graveyard as himself. Lets not dress up this murder up as something honourable the only great thing there was the men who lives were taken for whatever reason you may state… Sweeney in this family will always be a traitor. Your research is greatly appreciated, along with everyone’s comments. Recently started family history research. Surprised to find so much about Sean Larkin and the war. Sean was my great, great, great uncle. In particular on the internet found the two letters he wrote the night before his execution, one to his mother and one to his sister. Profoundly moving, he was at such peace. I was fortunate to have know his brother, Fr. Michael Larkin S.M. in died in 1984, in San Francisco, CA. I attended the unveiling of the memorial to the Drumboe Martyrs, Easter 1955 with my father Aedan MacFhionnlaoich and Cissie McCallion, sister of Sean Larkin.Peadar. Thank you for your comments. Sean Larkin was my cousin, I knew his brother Fr. Michael Larkin who came to the US. Fr. Larkin did in the early 1980’s here in San Francisco, California. He was about 96 years old, and reading the WallStreet Journal everyday. I’m Dermot – my uncle was Sean Larkin, and I have – like yourself – followed the history of The Drumboe Martyrs with that bit of personal interest. Been interested in Fr Michael, whom I clearly recall visiting us here in his native Belagherty, Ballinderry. Is he buried in San Francisco, and do you have any other details? I know he was a Marist priest, with a PhD degree, I think in Economics, hence his interest in the Wall Street Journal. He didn’t half enjoy his vacations back in Ireland, and I recall his taking my brother and I to school in the morning in a swanky car, when, otherwise, we’d have to trod the 2 miles on foot! He would say the weekend Mass here in Ballinderry and visit his sister Tilly, my mum. A long time ago! The Drumboe Martyr’s history is so bloody sad, and we still have the remnants of it all with us, unfortunately. So glad to hear from you! Fr. Michael was an incredible man. I was living in Boston and had a business trip to San Francisco. My mother had just died a few weeks before. Found out he was at the Marist retirement home in SF so decided to visit. He was quite elderly and I was concerned he would confuse me with my mother, her name was also Marguerite. I met him and he was sharp as a tack. He pointed out to me on the bulletin board that when the 106 Marist died he would be the oldest living Marist ! Great sense of humor and up-to-date on all current events. Would be wonderful if you could email me directly so I could share more information. HCCybervest@aol.com My full name is Marguerite McHenry so you can also google me I am on linked in and my email information is there too. I am on Facebook along with many of your cousins the Morton Families. West Brits (Fianna Gael) back running the Country again. England was never the problem, To many cowards in this country and the English make use of them. laughed at you referring to Fine Gael as West Brits-often wonder will we ever hold England accountable-but we would first have get off our knees to come to a standing position from the bowing and scraping we seem to do still. anyone know of a Dan Kelly from Derry who was station master at Cashel na nGorr station near Gort an Choirce. he was sent to train volunteers in the area. he was in the Castelfinn area previous to that and was sent to Dungloe afterwards? Hi James, dunno if it’s the same man but a Daniel Kelly from Derry gave a statement to the Bureau of Military History (WS#1004), he also gave an interview to Fr Louis O’Kane which is part of the O’Kane Collection at the Cardinal O Fiaich Library & Archive in Armagh. i have just written a tribute to a staunch republician, John Madge Ó Gallachóir from Gaoth dobhair who passed away recently. his father spent time in jail with the drumboe martyrs and his grand aunt biddy coll was jailed in derry for the killing of inspector Martin the RIC man who was carrying out evictions in Gaothdobhair. anyway this is another bit of news to add to the fact that John never missed the annual Drumboe comemoration. My grandfather rebel was working in Greenock Scotland and IRB came to grandma and said Tommy is on the boat to Movile the Brits have come to arrest him. That she had to get on boat must leave everything. The next time 1921 back in Donegal the Back and Tan came looking for Tommy again. But the most dangerous time was 1922-23 when Free State soilders came for grandpa Tommy. This time he was upstairs with a pistol and was not going with them. This article shows why my grandfather had to leave Donegal. He could not go back to Scotland to work and no jobs for a publican in Pro treaty Donegal. So Tommy and wife and 3 kids ended up in NY , in Irishtown the worst slum in Brooklyn. many horrific endings to men who fought in the war of independence, for a just and honorable cause of an independent thirty two county Ireland, only for it to end up divided in a truly unjust manner, with the six countys nationlists left abandoned to live as seconed class citizens under a contrived majority of british unionists. An addendum: the Cardinal O Fiaich Library & Archive in Armagh holds the Fr Louis O’Kane Collection, among which are recordings of interviews he conducted with northern veterans of the War of Independence. One of those interviews was with Tom Morris, who replaced Charlie Daly as O/C 2nd Northern Division. In another interview, with John Duffy, a former member of 2nd Northern (although he was originally from Co. Antrim), Fr O’Kane speculated that the reference to “SL” in a radio message to Sweeney may have been intended to refer to Seamus (Jim) Lane, a Cork Republican who was captured and court-martialled at the same time as the others who were executed at Drumboe. I am researching the history of Jimmy Donaghy, of Dungiven Co. Derry, who was one of the 8 men captured in Dunlewey. An interesting man, Jimmy served in the British Army was severely wounded and captured by the Germans in WW1 and after that war joined the IRA and was Quartermaster of the 3rd Dungiven Battalion, 4th Brigade, 2nd Northern Division. He was with Daly, Larkin and the others throughout their campaign in Donegal. I would appreciate any information of when he was released from prison after the Civil War. I know he worked as a postman in the Dungiven area later on. The four prisoners who weren’t executed, including Donaghy, were “encouraged” to sign a statement calling on their erstwhile comrades to stop mounting attacks on FS forces. This statement was published in the local press about ten days after the executions. It wasn’t quite the same as the pledge signed by others that they would take no further part in IRA activities which led to them being released (Sean Lehane was eventually court-martialled and dismissed from the IRA having signed such a pledge), so I can’t be 100% sure that they were released on foot of that. If they were kept prisoner, they were most likely transferred to the Curragh. I believe Military Archives has material relating to Republican prisoners from the Civil War so that might be one place to look. If he returned to Dungiven, then the N.I. government more than likely kept an eye on him It’d be worth checking through the HA/5 and HA/32 (Ministry of Home Affairs) files in PRONI – the list of file names can be accessed on their website though the files themselves aren’t digitised so it’d mean a trip to Belfast. Can you imagine the excitement when we found your history?? Just today, Bruce was going through his papers and found the Larkin letter that he had been telling me about. It was the letter to his mother the day before his execution and in it he tells her that he had found out at 4:00p.m. that he would be executed the next day. He said Fr Mc Mullen heard his confession and he spoke of the few possessions of his that he was sending to her and how peaceful he felt. It was a beautiful letter and it was signed Jack Larkin. Bruce’s e-mail is banorth40@gmail.com. He is eager to know how he may be related to Sean Larkin. His mother’s family was from Ireland. I hope you can correspond with hin. I also asked Dermot if he would do the same. Thank you for your beautifully weitten history. Who owned the Drumboe Castle at the time of the executions? I am a decendant of Samuel Edmund Hayes. Isn’t the actual execution site up a slope and in the pasture across the road from the castle ruins and surrounded by a fence? Your right Sammy, I’m from Tir Chonaill myself and yes the execution site is not at the castle but in a field or slope up from the castle or the ruins of the castle. It is actually in a field mo chara and the very beautiful monument is a Celtic Cross surrounded by a wall with steps up to the cross. Two of the executed martyrs were close family friends of my immediate clann as they were all on the Republican side fighting in the Third Defence of the Republic otherwise known as the Civil War or Free State War of Aggression. The First Defence was in 1916 and the Second Defence of the Republic was in 1917/1918-1922. through a female line. I had no idea at all that a male line existed for this family. How can I contact you? Kieran, thanks for an excellent article! I feel that you have done a great job showing the tragedy of the civil war. How close friends became enemies, and how small differences of opinion lead to tragic results. The execution of the Drumboe Martyrs was an atrocity by the Free State authorities. But how did they and hundreds of brave republican fighters from Munster, Derry and Tyrone arrive in a situation where they were completely vulnerable to attack by the Free State? In his book the Singing Flame, Ernie O’Malley, explained how the Republican Leadership–Rory O’Connor, Liam Lynch et al through their inaction allowed the Free State to set up an army to beat them instead of arresting Collins on his return from London. Sending hundreds of republican fighters from Munster, Derry and Tyrone to “co-operate” with their free-state enemies in Donegal “in an attack on the north”, is another example of the abject failure of Republican leaders to defend the 32-county republic. They sent their front line troops into a free state military trap! The reality was that the republican leaders were terrified by the Munster “Soviets”(creameries seized by workers), the land seizures, the farm labourer strikes …. They were politically and militarily paralysed by their links to the propertied classes. just wondering which of the martyrs you have the letter from? It sounds like quite the find. Are you related? My Grandfather told me the story of the Drumboe martyrs he was Last surviving member of Mountcharles old Brigade Paddy Cunningham was his name he was captured by freestate forces and intured in the curragh. Were there any free staters from Buncrana present at the killing of the martyrs? There are rumours but it would be know for certain.